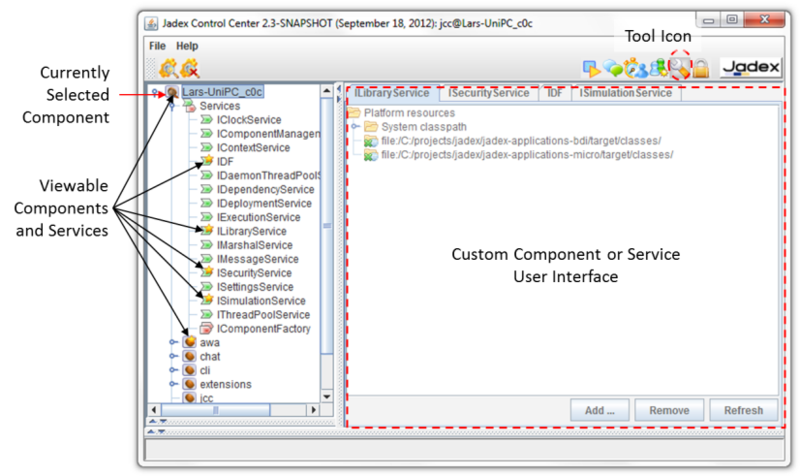 The component and service viewer is a tool that displays custom component or service user interfaces. The tool consists of two areas (as shown in the screenshot above). On the left hand side the component instance tree of the platform is shown. 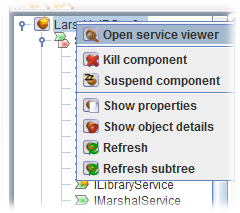 In addition to the normal view, components and services provides a user interface representation are marked with a yellow star. Clicking on such a viewable component or service will open the corresponding visual representation on the right hand side of the tool. As an alternative also the popup action "Open service viewer" can be used to open the user interface. In the screenshot above the platform itself has been selected and as its user interface a tabbed panel of its viewable services is shown. Clicking again on an activated element will close its view. Please refer to the AC tutorial Exercise F2 - Component Viewer in order to learn about how a user interface for a component can be created.